Orthopedic devices can be used to supplement or replace surgical treatment of cranial cruciate ligament (CCL) insufficiency, shoulder injury, carpal and tarsal injury, hip luxation, and limb salvage with prosthetics. Although use of orthopedic devices, including custom orthotics, braces, neoprene slings, support wraps, and prosthetics, often leads to a successful outcome, the expected outcome as well as objective and subjective outcome measurements should be discussed with the owner prior to device placement. CCL insufficiency is the most common cause of hindlimb lameness in dogs.1 Numerous surgical treatment options exist, but surgery is not always a possibility. Concurrent medical problems, financial concerns, or staging procedures for bilateral CCL insufficiency are all reasons for either forgoing or delaying surgical treatment. 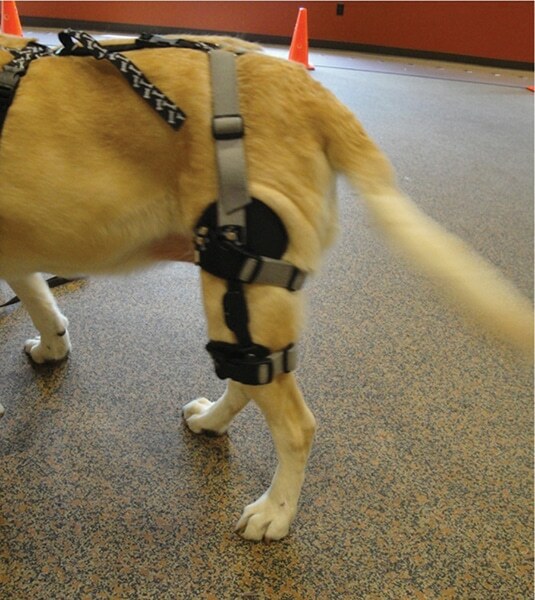 Recently, the use of canine stifle braces has emerged as a potential therapeutic approach to managing CCL insufficiency. Studies are under way investigating whether braces are truly able to stabilize the stifle and eliminate cranial tibial thrust and internal rotation. Slow movement down to allow muscles time to react and control motion. Prophylactic braces prevent or reduce severity of knee injuries in contact sports. Functional braces provide stability for unstable knees. Rehabilitative braces allow protected and controlled motion during the rehabilitation of injured knees. Patellofemoral braces improve patellar tracking and relieve anterior pain. 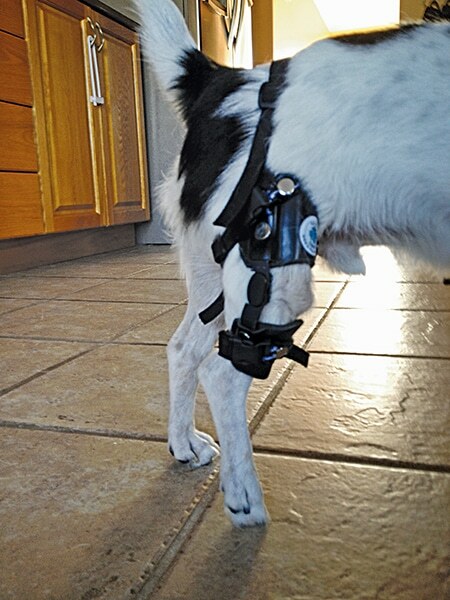 Of these braces, only functional knee braces are used in veterinary medicine. Owner’s willingness to comply with necessary care. Age should never be the sole reason for recommending against surgery. For example, an overweight 13-year-old Labrador retriever, with an acute CCL rupture, that spends most of the day recumbent and only goes outside to eliminate may be a better candidate for a stifle brace than a 13-year-old Labrador retriever in good body condition that goes on daily runs and hikes. The more active dog is better served by surgical treatment. Although numerous stifle braces are available for veterinary use, in our experience custom-made, hinged braces are the most effective. Proper construction is imperative to create a comfortable and functional brace (see Constructing a Custom Canine Stifle Brace). The most important step when constructing a custom stifle brace is taking a proper cast mold of the affected limb. Using soft fiberglass casting, cast the limb from mid thigh to just proximal to the paw (Figure 1). A normal, standing angle at the stifle (approximately 130°) must be reflected in the cast as accurately as possible. With patient in lateral recumbency and the limb in a neutral position. FIGURE 1. Patient being casted for a left stifle brace. Ideally, casting is performed with the patient standing and bearing weight on the affected limb. Pour the cast with plaster of Paris to create a positive model of the affected limb (Figure 2). Modify the mold to accommodate for bony prominences and sensitive areas as well as sculpt it to fit the affected limb. Heat and vacuum-form foam and high-temperature thermoplastic around the mold in varying layers/designs to create the most functional custom product (Figure 3). While braces that are not custom-made are more affordable and easily acquired, they do not support the stifle or eliminate instability. Furthermore, if the brace is not designed to fit a specific patient, rubbing of the skin against the brace can lead to skin wounds (see Fitting & Using Custom Stifle Braces). Adjust and check the brace frequently in the first 72 hours to help find the best fit. It usually takes 24 to 72 hours for the patient to become accustomed to the brace, and during this time its gait may be altered. 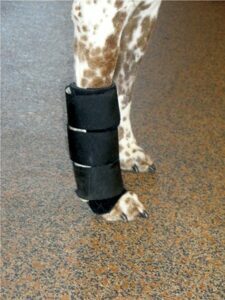 Remove the brace at night while the animal sleeps to help reduce risk for swelling. During the first 2 weeks, check the brace and areas of contact at least twice daily for sores or damage to the device. Schedule re-evaluation appointment 2 weeks after the initial brace fitting to ensure that the brace still fits appropriately and there are no concerns or problems. FIGURE 4. At the fitting appointment, proper fit and alignment are confirmed. Have the patient walk around to ensure that the brace does not slip or slide, which could lead to rub sores and impaired function. Explain that there may be some areas where the hair may rub off and form a callus (Figure 5); this is not unusual but should never progress to an open sore. If an open sore is noted, have the owner schedule re-evaluation as soon as possible. Should the brace become wet, instruct the owner to remove it immediately and allow it to dry before placing it back on the patient. FIGURE 5. Owners should be informed that the stifle brace may contact some areas of the skin, and the hair may rub off and form a callus. This occurs most commonly if the brace extends distally toward the hock, as in this patient. This patient also exhibits an area of erythematous at the distal aspect of the callus. 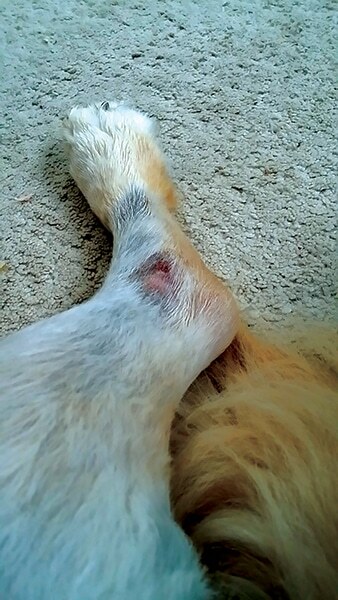 If left untreated or not monitored, this area of erythematous could progress into an open wound that would require more intense management. In theory, custom-made, functional hinged stifle braces remove the strain on the CCL, allowing the stifle joint to function normally and the patient to perform normal activities of daily living, which should reduce muscle atrophy. 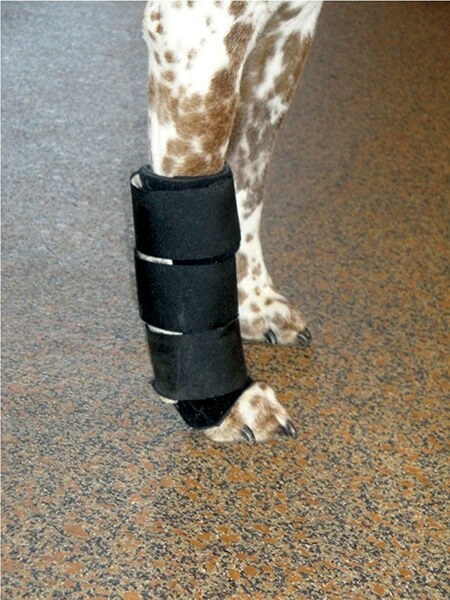 The brace provides a set path of motion for the tibia under the femur by locking onto the long bones of the leg and preventing excessive cranial–caudal movements.3 Unfortunately, data proving this in veterinary medicine are lacking; furthermore, the theory of why functional hinged stifle braces work can only be applied to custom-made braces. Individual companies use different criteria for determining the correct fit of their devices. We encourage practitioners to contact the specific company directly in order to determine correct fit. Medial shoulder instability is a common cause of forelimb lameness in dogs. Diagnostics and treatment options have been well documented (Figure 6).5-7 However, postoperative rehabilitation programs and nonsurgical treatment options are not well described. Depending on the severity of the instability, conservative treatment using a rehabilitation therapy program or surgical intervention followed by rehabilitation therapy may be considered. FIGURE 6. 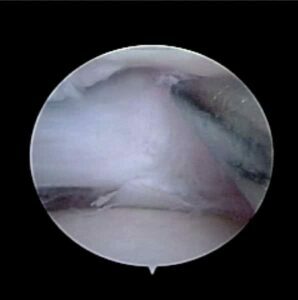 Shoulder arthroscopy of a patient with medial shoulder syndrome; note disruption of the subscapularis and medial glenohumeral ligament. Some surgeons and rehabilitation therapists use a commercially available neoprene shoulder stabilization system to protect the shoulder during the rehabilitation period. No published studies have compared recovery with and without a shoulder support system following medial shoulder instability surgery. However, thousands of arthroscopic procedures to address medial shoulder instability have been performed at our institution, and use of a stabilization system is considered the standard of care following arthroscopic or open medial shoulder instability repair. The shoulder stabilization system consists of removable, breathable neoprene/polyester sleeves that are placed over the shoulders of the patient and attached securely via Velcro to each forelimb. 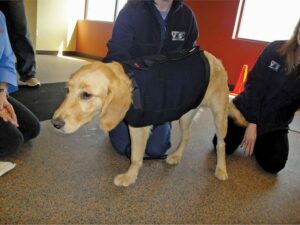 One- or 2-inch double-sided Velcro strips serve as a hobble strap to prevent abduction of the forelimbs (Figure 7). Other shoulder stabilization devices include the shoulder spica stabilization vest (Figure 8) and Velpeau sling (Figure 9). FIGURE 7. 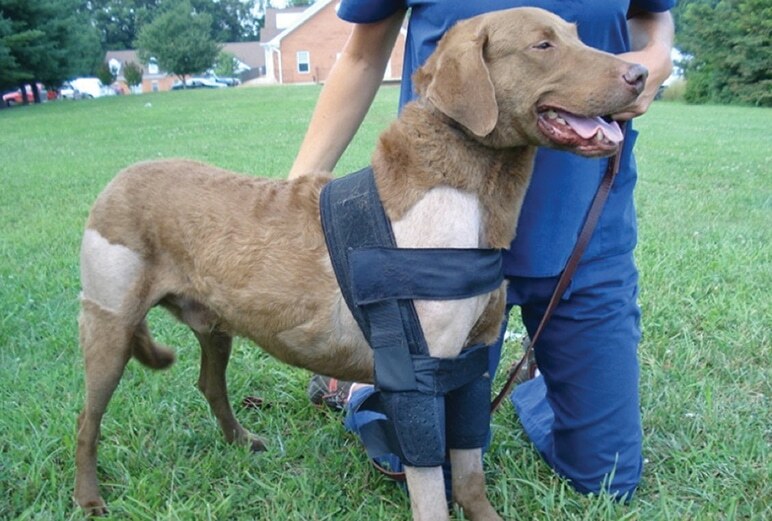 A shoulder stabilization system consists of removable, breathable neoprene/polyester sleeves that are placed over the shoulders of the patient and attached securely with Velcro to each forelimb. One- or 2-inch double-sided Velcro strips serve as a hobble strap to prevent abduction of the limbs. FIGURE 8. 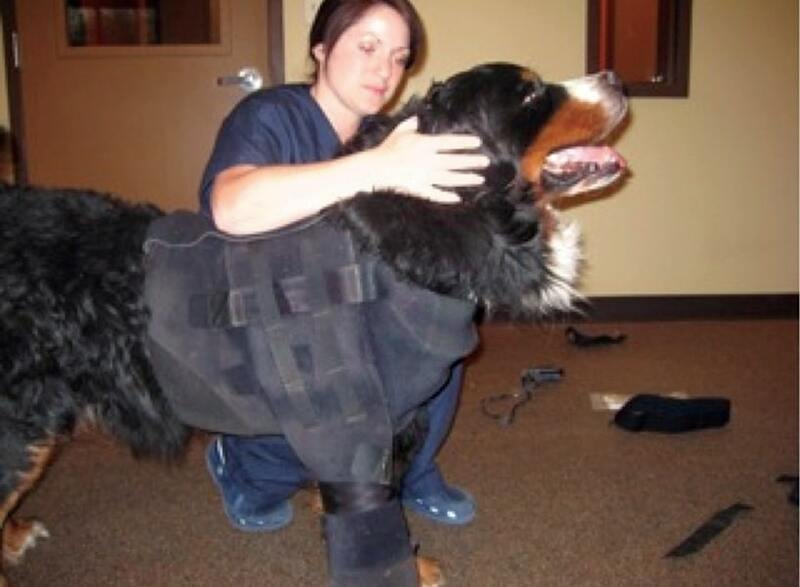 Patient wearing shoulder spica stabilization vest. FIGURE 9. Patient wearing shoulder Velpeau sling. The shoulder stabilization system, which can be applied following arthroscopy while the patient is under anesthesia, limits abduction, flexion, and extension of the shoulder but allows for full weight bearing. Patients are able to bear weight immediately and adapt quickly to the device. A shoulder stabilization device can be worn continually for several months with minimal irritation and can be removed and reapplied easily for rehabilitation therapy. Carpal and tarsal devices have been used with both humans and dogs with hyperextension injuries, sprains and strains, and Achilles tendon disruption. Orthotic devices can be used for both nonsurgical management and to enhance postoperative management of these conditions. FIGURE 10. Neoprene carpal support wrap with thermoplastic for additional support. FIGURE 11. Patient that sustained a bilateral Achilles tendon rupture secondary to trauma wearing bilateral controlled, range-of-motion, hinged tarsal braces. Depending on the injury and recommended treatment plan, many of these devices can be designed to allow dynamization of the tissues over the recovery period, which gradually increases forces on the tendons and stimulates healing. Patients can also be transitioned to a less cumbersome device during the recovery period to support healing. When the device arrives, schedule a fitting appointment, following the same parameters as for CCL braces (see Fitting & Using Custom Stifle Braces; Figure 12). In addition, wraps and braces used for the carpus and tarsus need to be snug to be effective, but not so tight that the toes swell. If the toes swell, the brace should be removed for a few hours until the swelling resolves. Massaging the toes helps the swelling subside. If excessive sweating is noted, talc powder may be used to help keep the skin and device dry. FIGURE 12. When the wrap or brace arrives, schedule a fitting appointment to confirm fit and show the owner how to properly place and remove the device. 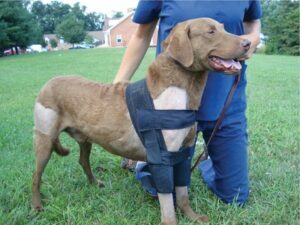 Ehmer slings are commonly used in dogs to protect the hip following conservative or surgical treatment of coxofemoral luxation.3 Ehmer slings are not easily removed and reapplied, limiting the ability to perform rehabilitation therapy. In addition, Ehmer slings commonly cause secondary skin irritation and abrasions. An alternative is the vest with Ehmer sling, a custom form-fitting sling that allows for proper positioning and immobilization, while enabling access for rehabilitation therapy (Figure 13). This sling is manufactured using a fabric that is stretchable, breathable, antimicrobial, and bactericidal. FIGURE 13. Patient wearing a vest with Ehmer sling, which allows for proper positioning and immobilization, while providing access for rehabilitation therapy. 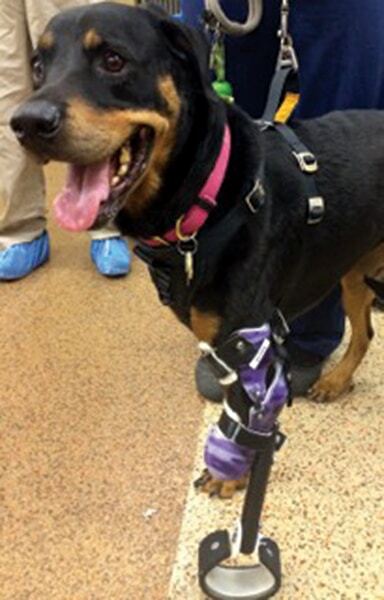 Neoplasia and severe trauma are common reasons for amputation; however, giant breeds or dogs with concurrent orthopedic disease may respond poorly to amputation.3 Forelimb (Figure 14) and hindlimb (Figure 15) prostheses offer an alternative to full-limb amputation. To be a candidate for a prosthetic, a partial limb amputation must be performed (see Prosthesis Success). FIGURE 14. 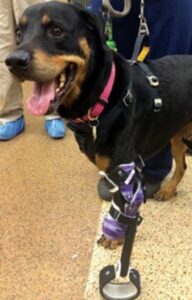 Forelimb prosthesis for a patient after limb-sparing surgery for osteosarcoma. FIGURE 15. 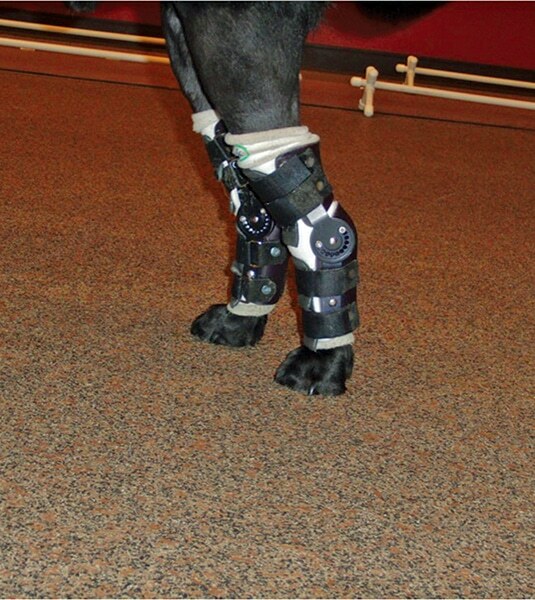 Hindlimb prosthesis for a patient after limb-sparing surgery for a highly comminuted fracture. A recent study in humans showed that the level of amputation is a critical factor in prosthesis success. Patients in this study had better outcomes when the amputation was performed distal to the carpus or tarsus.8 However, this is not always practical. Ideally, the elbow and tarsus should be spared. Surgical technique is also thought to have a significant impact on the success of prostheses.3 Correct incision placement, proper soft tissue technique, and meticulous management of nerve and vascular structures are vital to achieving a successful outcome.3 Thus, consultation with a small animal veterinary surgeon is recommended. However, both surgeons and general practitioners are instrumental in the postoperative management of the patient outfitted with a prosthetic. Suspension devices or harnesses, such as belts, cuffs, wedges, straps, and sleeves. FIGURE 17. 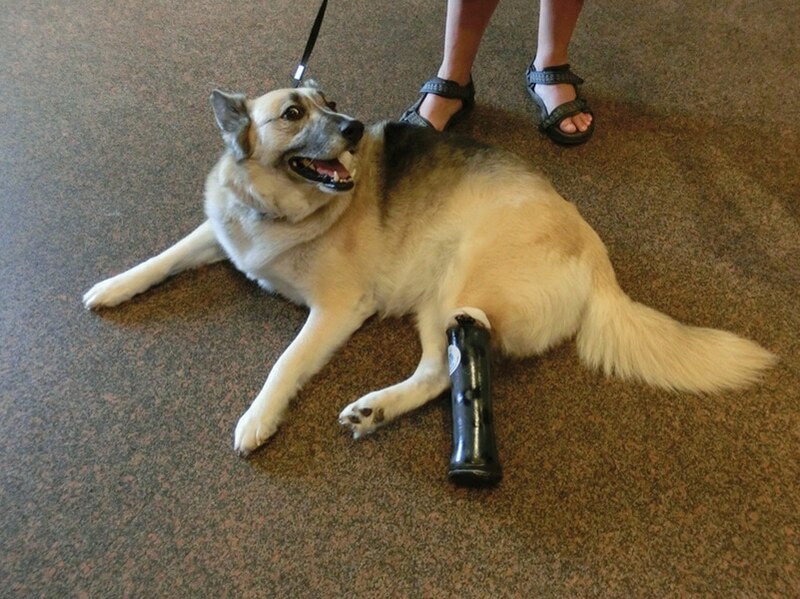 Patient wearing a hindlimb prosthesis with a suction suspension system with a gel suspension liner. Similar to braces, the most important step when constructing a prosthesis is making a proper cast mold of the affected limb (see Constructing a Custom Canine Stifle Brace). In addition, padded sockets are often needed to create a more intimate fitting device. The shank and feet are created from aluminum, steel, carbon fiber, or wood, depending on the size and activity level of the animal. A “rocker bottom” foot is very commonly used to mimic the normal gait cycle (see Figure 14). The shank/foot is aligned under the weight line and abducted 5° for contralateral limb clearance. A toe out of about 5° to 7° is also added for stability and to allow for lateral movement. When the prosthesis arrives, schedule a fitting appointment to show the client how to put on and remove the device. The device should be kept snug because a loose fit will result in friction and skin irritation. Prosthetic devices should be worn in short, increasing increments in order to build up a tolerance to them. Both the length of the break-in period and the time of each increment depends on the patient’s diagnosis. For best results, it is recommended to place the prosthesis on the patient for only 30 minutes the first day, increasing by 30 minutes each day. A short, but variable, period of time is often required before the patient accepts and becomes accustomed to the device. To help facilitate acceptance, the device should be associated with positive reinforcement. A re-evaluation appointment is recommended 2 weeks after the fitting appointment to ensure that there are no problems or concerns. It is not uncommon to see minor problems within the first few weeks. 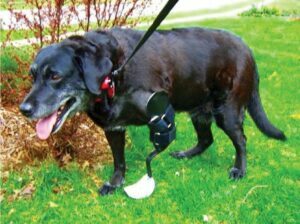 Either the veterinarian or orthotist, depending on the needed modifications, can easily adapt the prosthesis to relieve any areas of irritation. It is also important to inspect the device regularly for any cracks or tears. Padding and Velcro can be replaced at re-evaluation appointments as needed. Cleaning: It is important to keep both the orthosis/prosthesis and the skin in contact with the device clean; this reduces the risk for contact dermatitis or other skin conditions. The device should be cleaned regularly using a 1:1 mix of water and alcohol and a clean towel. The device should be towel dried or allowed to dry at room temperature. Hair dryers and clothes dryers should not be used. Dampness: Cotton socks are often used to help with excessive sweating and to keep the device clean. 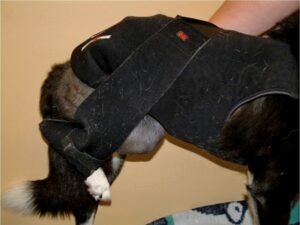 A wet brace or cotton stockinet should never be placed on the patient in order to prevent rub sores. Some devices can be worn in the water, but this should be clarified with the orthotist first. Skin: It is of extreme importance that the patient’s skin is inspected thoroughly after every use, especially during the break-in period. Skin redness that does not disappear within 20 minutes or evidence of skin breakdown is a sign of excessive pressure. Instruct the client to discontinue use of the device for a full day if irritation or skin breakdown is noted. Clients should also note any unusual marks on the skin, blisters, or excessive wearing of the device. 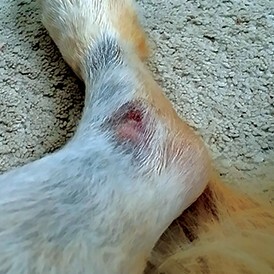 If any of these conditions present themselves, use of the device should be discontinued and the client should contact the veterinarian immediately. Although many orthopedic devices are available (Table), it is important to note that they alone are not always the silver bullet; rehabilitation is usually required in addition to device use. Proper fit and appropriate use of the device are equally important to achieving a successful outcome. Re-evaluating each patient after fitting a device ensures that the patient is comfortable and the device is effective. Frequent device adjustments may be needed within the first 2 to 4 weeks if the patient is having difficulty with the device. 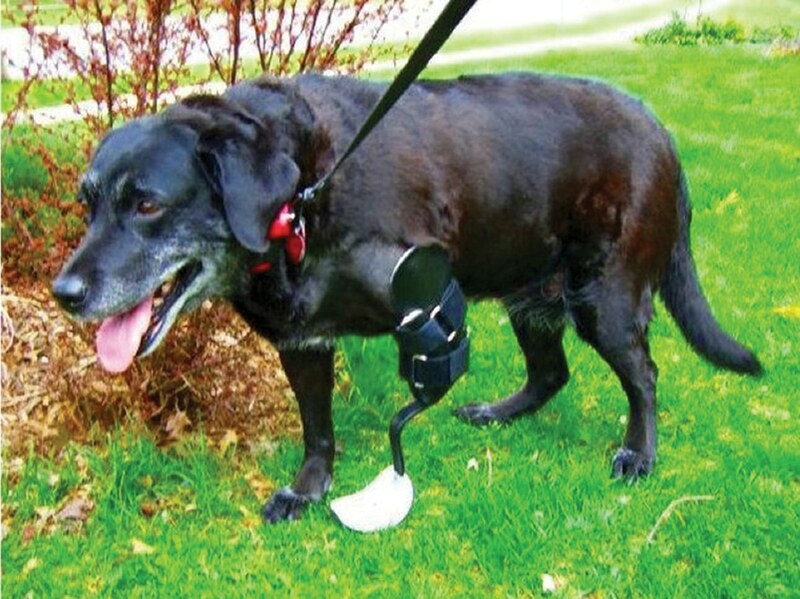 Depending on the adjustment required, this may be performed by the owner, the veterinarian overseeing the device or prosthetic, or the orthotist. Owner compliance is very important when using any of these devices. Owners should be properly educated on applying and using the device properly. Kowaleski MP, Boudrieau RJ, Pozzi A. Stifle joint. In Tobias KM, Johnston SA (eds): Veterinary Surgery: Small Animal. St. Louis: Elsevier, 2012, pp 914-918. Briem K, Ramsey DK. The role of bracing. Sports Med Arthrosc Rev 2013; 21:11-17. Canapp SO, Campana DM, Fair LM. 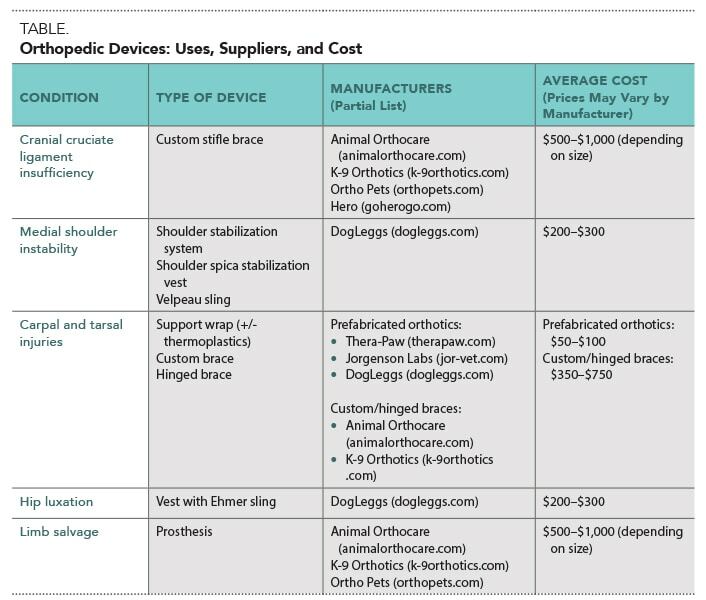 Orthopedic coaptation devices and small-animal prosthetics. In Tobias KM, Johnston SA (eds): Veterinary Surgery: Small Animal. St. Louis: Elsevier, 2012, pp 628-646. Canapp SO, Meillieur S, Carr BJ. The use of canine stifle braces for cranial cruciate ligament insufficiency. Proc ACVS 2014. Cook JL, Renfro DC, Tomlinson JL, Sorensen JE. Measurement of angles of abduction for diagnosis of shoulder instability in dogs using goniometry and digital image analysis. Vet Surg 2005; 34(5):463-468. Cook JL, Tomlinson JL, Fox DB, et al. Treatment of dogs diagnosed with medial shoulder instability using radiofrequency-induced thermal capsulorrhaphy. Vet Surg 2005; 34(5):469-475. Franklin SP, Devitt CM, Ogawa J, et al. Outcomes associated with treatments for medial, lateral, and multidirectional shoulder instability in dogs. Vet Surg 2013; 42(4):361-364. Burgess EM, Matsen FA. Determining amputation levels in peripheral vascular disease. J Bone Joint Surg Am 1981; 63:1493. Fitzpatrick N, Smith TJ, Pendegrass CJ, et al. 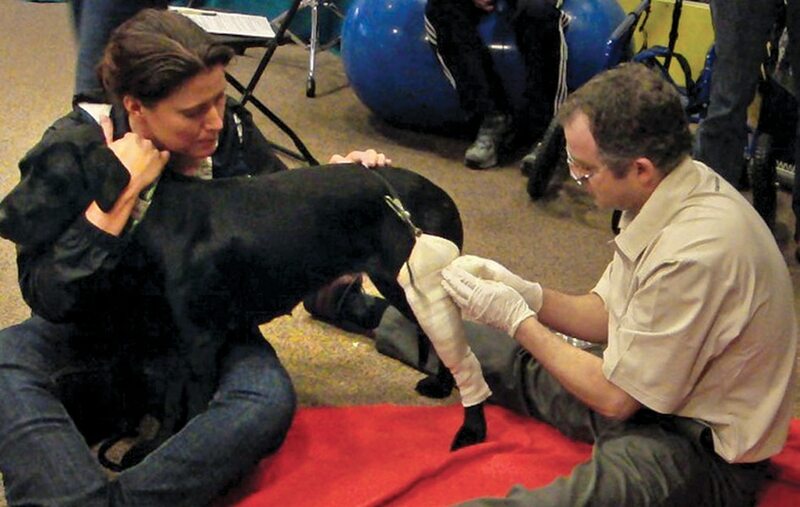 Intraosseous transcutaneous amputation prosthesis (ITAP) for limb salvage in 4 dogs. Vet Surg 2011; 40(8):909-925. David L. Dycus, DVM, MS, Diplomate ACVS (Small Animal), is a staff orthopedic surgeon at the Veterinary Orthopedic & Sports Medicine Group (VOSM) in Annapolis Junction, Maryland. He has presented at national meetings, lectured second- through fourth-year veterinary students, and published an array of research articles and a book chapter. Dr. Dycus received his DVM from Mississippi State University, completed a rotating internship at Auburn University, and earned his MS and completed a small animal surgical residency at Mississippi State University.